This season has done nothing for me. I just don’t care about these characters anymore. Time to end this thing. We keep watching because we want to see how it ends. Hopefully ratings keep dropping and they wise up. Fear The Walking Dead was really entertaining this season. Looking forward to the next season of that show. BUT, I will keep watching because I need to see them all die. They have until the end of this current season to make it happen or else I AM LEAVING! Seriously I might stop watching this soon, make everyone die and end it please. I still watch it and I thought this season so far is great.. Great mid season finale! I find it funny when people turn against shows they used to like and talk crap about it. It's like the writers owe them a masterpiece tailored to their personal tastes as payment for having watched in the first place. If you don't like it anymore change the channel and move on. The shows just bad daytime drama now with writers who only care about shock factor. I criticize it because it was a great show. The past couple seasons have been worse and worse. I’ve had other shows stay great throughout, so I’m pretty disappointed the way this whole thing has turned out and I doubt we get a satisfying ending to the show. Oh and I have stopped watching but had a quick look to see if the show had changed and nope. Still bad storytelling and lame shock attempts by a show runner who needs to go. Yep, struggled to get through the last 2 episodes. What a waste this season. Slowly watched their tactics to storm Sanctuary only to see that they escaped within 5 secs. You don't even see the escape! You get to watch long car rides or uninteresting conversations for half an episode, but Eugene's escape plan? Nothing. It's safe to say, that I'm done. I think I was after Glen died and Negan made his entrance. Also fuel should be gone by now surely. I am holding out hope that they filmed something and the Sancturay escape will be visually recounted later(but I'm not holding my breath). You know how this show should have ended? That chick in the coffin who takes poison and cries listening to her iPod, sorry I don't know her name btw. But she should have been the last of every one of her people or gang etc. and finally met with death and the show ends like that, final scene there you go let's move on now eh? OMG I forgot what a damn commercial bombardment comes with watching this show. Its like 31 minutes show and 29 minutes of commercials. 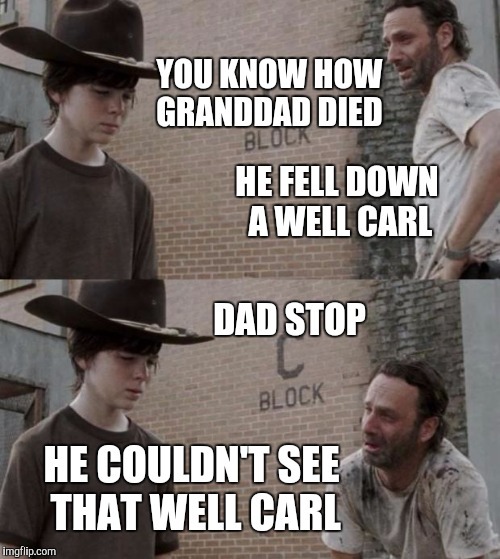 I think the new dude Carl saved could be a good character. Seems like cool guy. Nobody watching this anymore? Last night's episode was really good. I just watched the episode after the mid-season finale, was really good, agree the new guy seems cool. Haven't watched the next one yet but I plan to soon! I'm not. Stopped after last season. I'm going to watch it till the end just because I've put so much time into it. But I didn't think the last episode was especially good. Every episode since the Glenn and Abraham/ Lucille one have been pretty lackluster IMO. I was on the fence for a few seasons. Last season waste is what did it for me. A whole season of battles only to be undone in one episode. Basically, nothing happened. Then a weak battle between Negan and Rick. I didn't even realize it was back until tonight when I was skipping through channels and saw Talking Dead on and wondered "hmmm maybe it's coming back soon?" Haha, there's already been like 4-5 episodes aired and I had no clue. At least his finger wasn't on the trigger lol. What about Maggie and her Godfather moment? Wow, could be the nail in the coffin for this show. They should just end it with him leaving. Confirmed. Only in 6 episodes with Daryl taking over as main character. Maggie also being fazed out next season. Apparently killing off coral was what forced Lincoln's decision on top of not seeing he's family for long periods. Sounds like he hasn't been entirely happy with the direction of the show for a while. I finished the 2nd half of the latest season. I have to say my interest in this show was fading the last couple season, but the 2nd half of this season got me back into this. Well that was a satisfying conclusion to the last couple seasons arc. It could have been a complete end to the show. Watched the extended trailer for the new season. Looks decent.